Check here SBI PO Syllabus, Exam Dates, Pattern & Previous Year Cut Off . 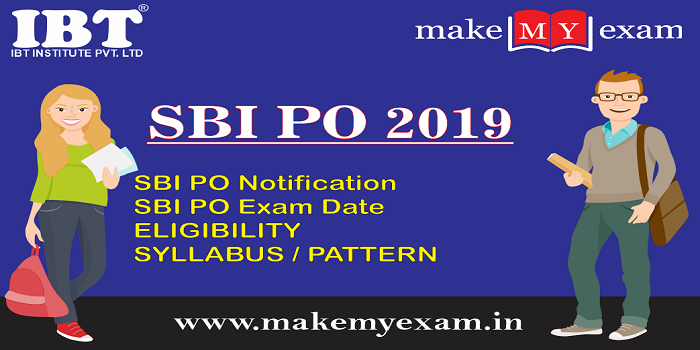 State Bank of India has released the SBI PO 2019 for eligible Indian Citizens for appointment as PO (Probationary Officer). The application is start from 2 April 2019 and will close on 22 april 2019. All the eligible candidates can apply for the same. Given are the Notification Details. The selection for SBI PO is will be done through three phases. Preliminary Examination (online) consisting of Objective Tests for 100 marks will be conducted online. This test would be of 1 hour duration consisting of 3 Sections as follows. Each test will have a separate timing as mentioned below. It consists of a paper of objective type (multiple choice questions) and carries a maximum of 100 marks to be solved in the duration of 60 Min. This is a screening test only to qualify for the next step and its marks will not be counted for determining their final order of merit. Note:-1. As per official Notification, descriptive papers of only those students would be evaluated, who qualify the objective mains exam. 2. Marks obtained in Objective, as well as Descriptive tests, will be added to the final Merit list along with marks of Group discussion & Interview. 3. There will be no sectional Cut-off in Preilims and Mains exam. The aggregate marks of candidates qualifying in both the objective tests and the descriptive tests will be arranged in descending order in each category. the candidates who clear the SBI PO cut off score of the Main examination would then be called for a Group discussion and Personal interview test where the candidates will have to face an interview board. The final merit list would be released on the basis of the candidate's performance in the Mains and interview. Nationality / Citizenship – Participants must have this citizenship which is given below. Age Limit – Interested candidates must have age between 21 – 30 years.